The End to Traditional Raid Sets? Ahh, gotta love some of these earlier ones! Yesterday, GameInformer released a summary of their Blizzcon interview with game director Ion Hazzikostas. While the article is rather scant on specific detail (I would imagine the full transcript of that interview will become available later), the main piece of news coming from the interview is that the traditional system of Raid Tier Sets is going away in Battle for Azeroth. 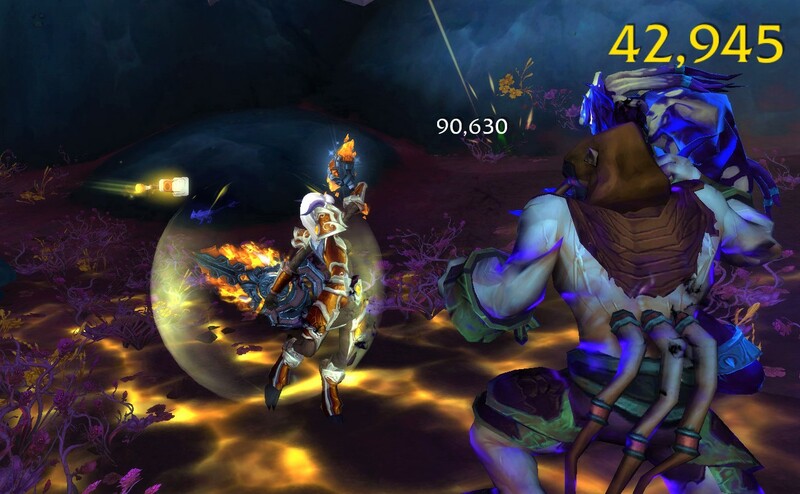 The article then speculated that the new Azerite system might take it’s place, allowing players far more flexibility in both abilities modified and pieces of gear equipped. The information about this thus far is really, really lacking (the article was only about three paragraphs afterall), but I have to say, I’m definitely intrigued to see how this change would pan out. Juggling tier and better loot has always been the bane of my existence, a situation that has only gotten worse in Legion. It’s a little soulcrushing to get brand new loot that would be good if it weren’t in a tier or legendary slot. I’m glad to see that Blizzard is awknowleding this problem and working to solve it. However, I think this plan, for what we know right now, has potential goods, bads, and just plain unknowns. Like I mentioned before, removing the requirement to wear certain pieces of gear to maintain a four set bonus gives the players a lot more choice in what they equip. Especially now in the world of Metzenforging (as my guild lovingly calls it), massive upgrades often have to be shelved because they do not proc in one of the ‘Free Spaces’ that is our Bingo board of gear. For myself personally, I’ve had the same Normal Warforged Tier shoulders on since I got them one of the first nights of Tomb of Sargeras, despite having several sets of shoulders that are significantly better stat wise, in order to maintain my four set. That’s incredibly frustrating. The RNG nature of gearing can already be very irksome, so that added disappointment of not being able to use upgrades is just insult to injury. If I get an ilvl 945 chest piece with enough critical strike to fill an ocean, I want to be able to use it, darn it! As it currently stands right now, raiders are locked behind a time gate in regards to tier. There are a set number of bosses that drop tier, and those bosses drop a set number of tier tokens (depending on your group size) each week. Those tokens can then either proc Protector, Vanquisher, or Conqueror, locking that item to specific classes. Perhaps one week you get lucky, and the boss drops one of each type of armor. But perhaps you get unlucky, and every token is a Vanquisher helm. And we haven’t even touched on group composition yet; suppose your raid has a ton of people on the Protector token and very little on the Conqueror token. Your paladin tank will get their four piece almost right away, but your hunters and warriors are straight out of luck with so many people rolling on, comparatively, so few pieces. For many classes, because of the necessity of the four piece bonus, certain tier pieces are their Best in Slots. Players will keep from rolling on other, non-tier pieces in tier slots because they are holding out for that tier drop. But because so many classes overlap on the same token, your Best in Slot chest comes from the same token that five other people do, even if folks are different armor classes or spec priorities. That’s a lot of artificially created competition in an arena that, I’d argue, already has plenty. Chasing after those tier bonuses adds weeks to the gearing up process. However, if I’m interpreting the article correctly, it sounds as if Tier Tokens might be done away with entirely (since there would no longer be any slots for raid sets). If that is the case, then raiders will no longer have to wait for weeks to get those bonuses. Gearing up would increase exponentially, since an entire extra layer of RNG would be removed. Absolutely, there would still be the RNG-laden hunt for BiSs, but players would be competing with a much narrower pool of competition. The number of potential upgrades would jump from just a few non-tier slot to practically every single one. Even as someone on the often underrepresented Conqueror token, I would have to say that this is a very, very positive change. The article was particularly vague on this topic (and I could have completely misconstrued it), but from what it sounds like, with the move away from tier set bonuses, Blizzard was also going to be moving away from tier set appearances. Potentially. 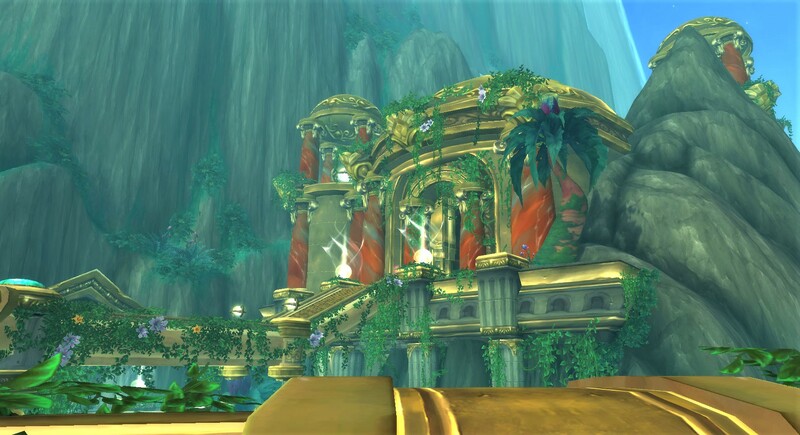 According to Hazzikostas, “the gear will be more heavily themed from the place it comes […] there’s more customization we want to express through the new Azerite system”, which could mean any number of things. Will there still be class appearance sets, but upgrading a specific slot will augment the look and make it cooler? Will they move away from class-inspired sets to a couple of more general raid appearances? And how will transmog for all of this work? You guys can read the original quote for yourself in the article, but the impression I’m getting is definitely a lot of column B. And I have to say, I’m a bit sad about that. While some sets are definitely more appealing than others, I’ve always loved the look of one unified look for each class per raid tier. There’s an excitement in the initial reveal. And the class fantasy is pretty great (especially for paladin that headcanon’s a very traditional paladin persona). This is absolutely not the worst thing in the world, but if class appearances sets truly are pulled, I will be saddened. Honestly, for everything that I’ve talked about thus far, the singular unifying idea right now is that there’s just so little information. Without the full transcript of the interview, we can’t get a solid glimpse at what Hazzikostas was describing. It might turn out that all of the ideas I proposed are moot point in just a couple months (although, it’s always fun to speculate now!). Here are some of my biggest questions regarding the switch that I just couldn’t comment on without more information. ⦁ Will the Azerite system act as a replacement with more options? ⦁ Will every piece of Azerite gear in the same slot have the same ‘talents’, or will it vary by piece? ⦁ If the latter, how many different talent options would there be? ⦁ Will talents be changeable? ⦁ Speaking of the Azerite system, how exactly does that thing work? ⦁ Are you planning on adding set bonuses to specific pieces of gear (i.e. a matching ring and cloak would unlock a small bonus)? ⦁ Any retroactive changes to older tier? ⦁ …And a whole lot more. I’m hoping more information about this will be available soon since this is potentially one of the bigger shake-ups for the raiding scene that Blizzard has implemented. And hey, if I no longer have to scare people off my tier token, I’m down for that! 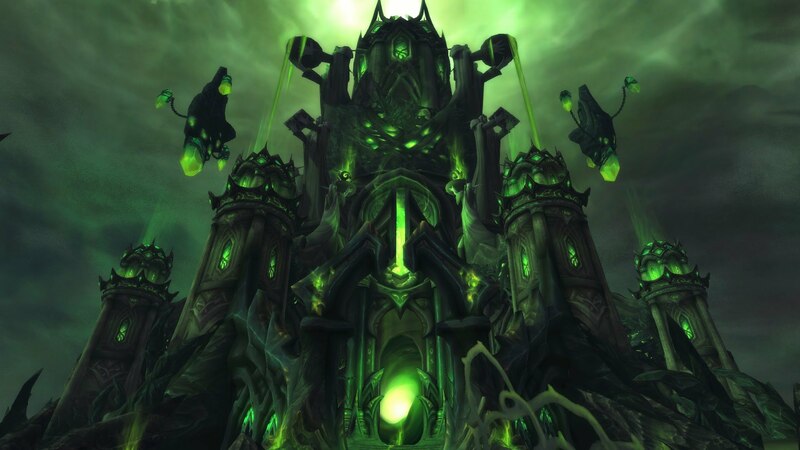 With Antorus on the horizon, we have official reached the twilight hour of Tomb of Sargeras. For my raid team, since we’ve all gotten our Ahead of the Curve achievements, this has meant that we are in a period of relaxation. 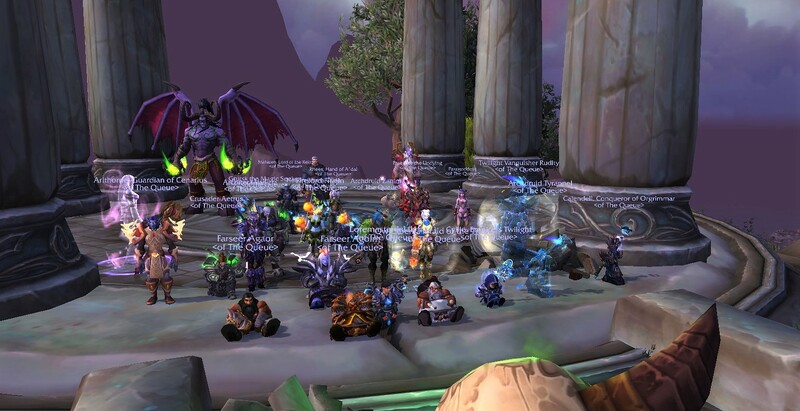 Our typical raid nights have changed from progression focused to alt focused as we push as far as we can into Heroic ToS in the five hours we have each week. 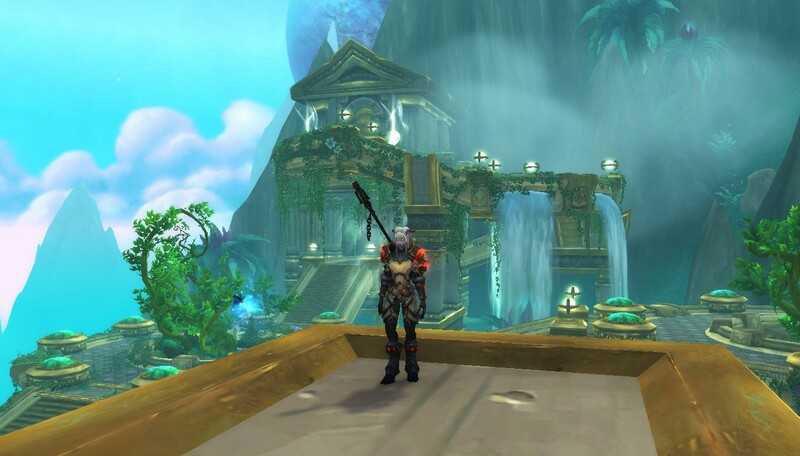 Even for someone like me, who loves her Holy Paladin to the ends of the earth, these alt-nights have been a fun break from a spec I probably play too much of. Heck, even a fun break from a role I play too much of. For the first couple of nights, I brought a DPS character, and learned that, despite my best intentions, I am not very good at damage dealing classes. Many moons ago, my mage was my predominant raiding character. I would sling ice at whatever threats faced Azeroth. I eventually switched over to healing full time (and never looked back) but my gnome mage has always held a special place in my heart. And one day, I always hoped to get back into the raiding groove with her. My triumphant return was a lot less triumphant and a lot more terrible. I’d thought I’d kept my mage pretty well geared and prepped all things considered, but I could barely pull my own weight. Even more embarrassingly, I died almost every single pull. Keep in mind, these are boss fights I have done dozens upon dozens of times. I know them so well I can do them in my sleep. But somehow, I could not make the jump from healing them to DPSing them. Alright so, mage is a bust, what about some of my other characters? Maybe a melee DPS? I brought in my monk and was met with even worse results, despite the fact that my monk’s gear is a tad stronger. Now this was just getting silly! I was beginning to think that healing was just about the only thing I could do. That wasn’t the worst thing in the world; there’s enough different healing styles that I don’t think I could ever get bored. But I’m supposed to have a competent offspec for raiding and, judging by my performance, it’d probably make more sense for me to sit than to bring a DPS character. But then, I found it. My second calling. And it was in one of the most unexpected places. 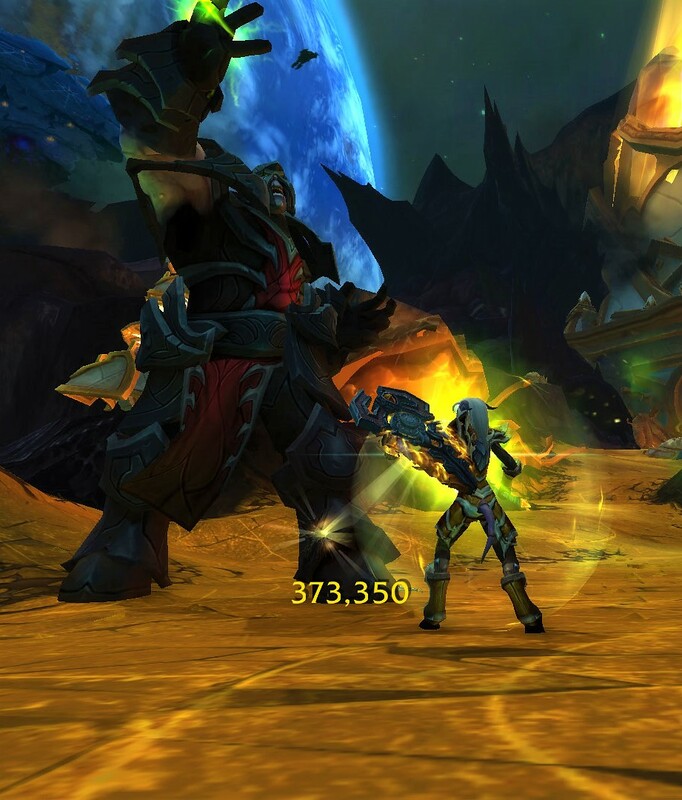 This past Saturday, more as a joke than anything else, I joined raid in protection spec on my paladin. My gear wasn’t the best in the world but really, the bigger hurdle was that, other than an odd mythic+ here or there, I hadn’t tanked all expansion. I only vaguely knew what my abilities did. I certainly didn’t know what the tank mechanics were other than the ones I had to heal through. And yet, there I was, joke-threatening to tank Heroic Maiden. Maybe they had faith or maybe they were just as crazy as I was, but my guild gave me the go ahead and I, joined with one of the main tanks, gave it a whirl. And… we didn’t die right away. And then, when we did wipe, it wasn’t my fault. What is this sorcery? As I discovered, quite literally on the job, Heroic Maiden isn’t too difficult of a fight to tank. The only major mechanic is the taunt off after every infusion or smash (depending on what your own infusion is). A quickie cooldown or Eye of Tyr for each Hammer Smash and I was pretty much golden! 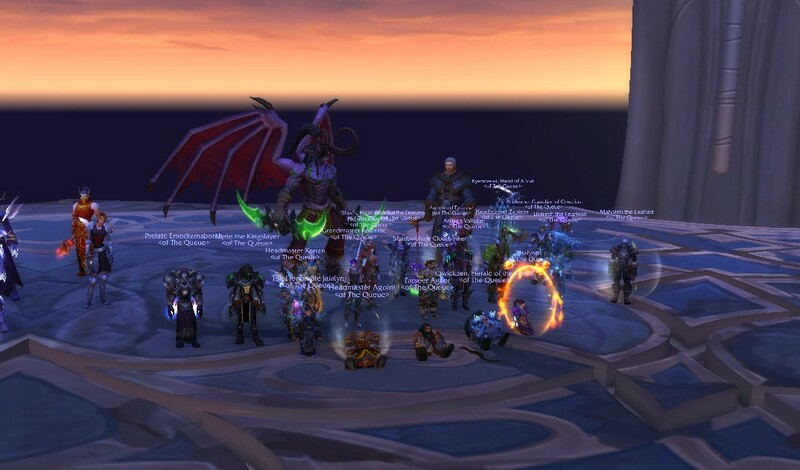 We tightened up mechanics on Maiden a bit and then got her down within the first half hour of raid, no mean feat considering the number of alts and folks who’d never seen the fight before. I even netted a pretty slick tanking trinket (to replace one of my healing ones I’d been wearing because I was suuuuuper prepared). Next up was something a lot harder: Heroic Avatar. As we’re riding the elevator down, one of the other main tanks who was on a DPS alt for the night whispered me, warning about the difficulties of the next boss. Grunty and Smashy, as they are affectionately called by my guild, are mean like bees and unforgiving to tank error. 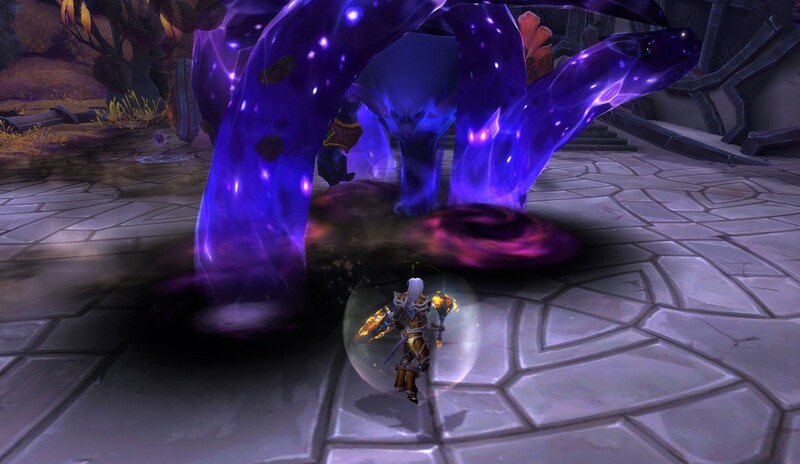 And, not only was I new to this fight, I was also playing a protection paladin, a spec that had encountered additional difficulties with almost all of the Tomb of Sargeras bosses. Still, I wanted to give it at least a couple gos. After all, I’d just gotten a new tanking trinket and now had a somewhat stronger idea of what my tanking CDs did! I pulled up my belt, taunted the Maiden, and we were off. I very quickly learned that Heroic Maiden is a walk in the park compared to Heroic Avatar. The fight features two mobs, the Avatar and a Maiden, that needed to each be tanked by one of the tanks for the start of the fight. 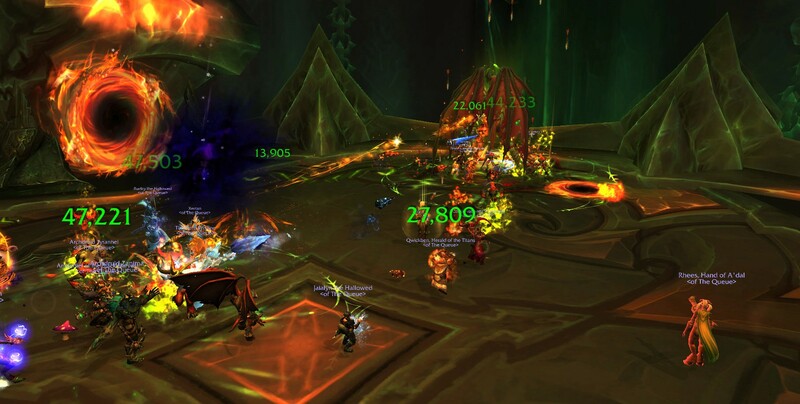 The tanks would then switch who they were tanking after the person handling the Avatar got two stacks of Devastate. This is further complicated by the fact that the Maiden has to be dragged all around the room to intercept beams of fel that are empowering the Avatar. And it was all just as hectic as it sounds. I started with the Maiden and I won’t lie, it took me a few tries to get the taunt swaps mixed with the movement correct. Those first couple of pulls, there was just so much going on that I’d lose track of my own health and then forget to use a CD when I needed to and would very quickly end up as a splat on the floor. But before long, I found a rhythm. Once I found that groove, I really started to get into it. There was something so steady and dependable about taunting off at the two stacks. And yet, the movement around the room kept the fight interesting and ever-changing. It was fun, and fun in a way I would have never expected. As the patterns got smoother and smoother, the stress of having the entire raid rely on myself began to fade away. I knew what I needed to do and knew how to do it. Unlike my DPS characters, when stuff went wrong, I could instantly identify where the error had occurred. Even though we were wiping, I could have kept going for hours. The zone, as I like to think of it, is something I love so much about healing – a mindset where I’m totally on top of the encounter but also completely relaxed. I’ve never reached that with DPS characters. And yet, on my first night of tanking, in Heroic difficulty no less, I found it right away. I’ve tried to get into tanking multiple times. I’ve tried leveling solely as tanks, tried testing it in battlegrounds, even tried throwing myself into mythic+s. 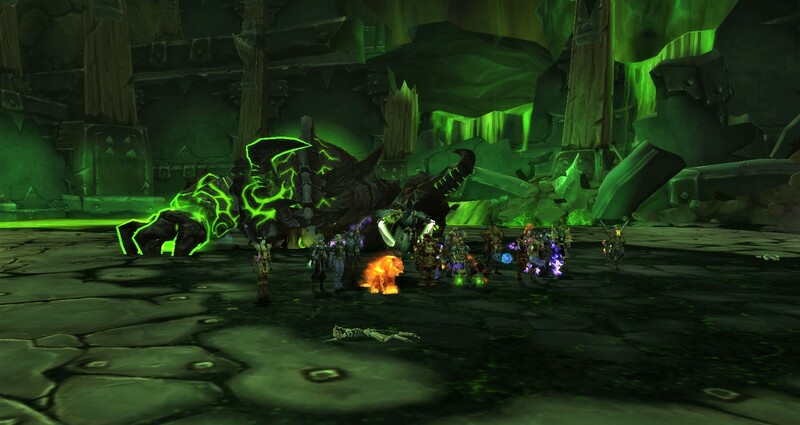 But apparently, the push I needed, hilariously enough, was the high stress atmosphere of Heroic raids. That is something I never would have guessed! The test going forward will be to see if this newfound excitement persists. I’ll probably never move past my love of healing, but tanking is promising to become a close second. I can’t wait for the next raid!